Every spring we enter into kidding season and that’s when all the fun begins! Raising dairy goats, we need to make sure our babies get plenty of social interaction with people so they will be friendly and unafraid of humans. And because most everyone we know, loves baby goats, Maaa-maste Goat Yoga was a natural solution that provided a healthy, relaxing activity for adults, combined with baby goats that like nothing more than to get in on the action. Our yoga instructors will guide you through a practice that offers beginning poses with alternative add positions for those who are more accomplished. You are encouraged to do what you can with no pressure to do more than you feel comfortable with. And, of course, there are the babies! If yoga is not your thing and you just want to cuddle baby goats, well we’ve got an App for that! We occasionally post goat cuddling days when you can drop in to cuddle the babies, or, you can schedule a group for your private cuddling time. Interested in learning more about Permaculture farming methods, goats, chickens or bees? School groups or private tours, we can schedule a tour custom tailored for your group and interests. Contact us today so we can plan your tour. Our mission has always been to create a permaculture farm that works in harmony with nature, seamlessly integrated within the Lowcountry vernacular, while sharing the knowledge we have acquired and the products we have produced with those who have yearned for a long lost connection to their agricultural heritage. Welcome to the journey! 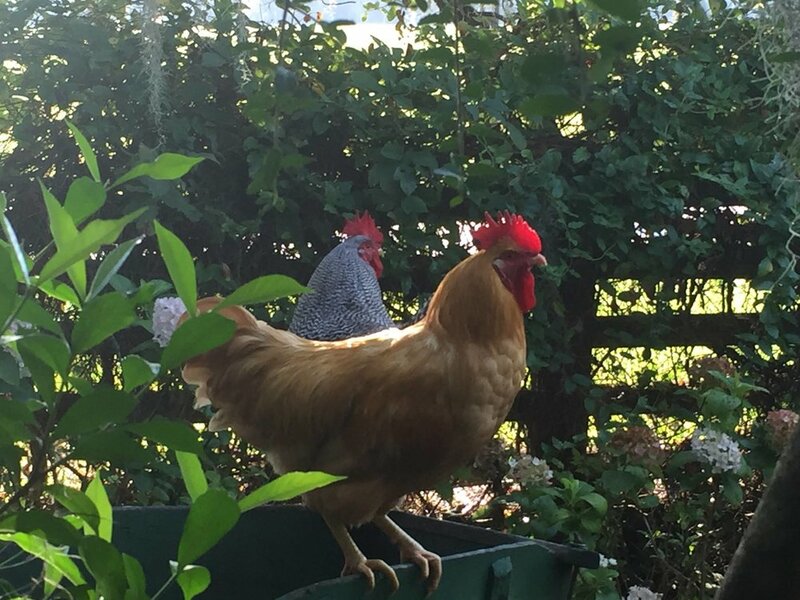 Roosters welcoming the sunrise on a summer’s morning. A French Alpine buckling born on the farm. Get recipes, produce availability and how to’s for fun farm centered craft ideas.